We love to host events on our campus. If you’re interested in reserving one of our facilities for your upcoming event, please read through the instructions, then fill out the form below. Interested in hosing a large event here over the summer? Check out our summer conferences page! Parties interested in using the McGlothlin-Street Theatre, Mary B. Martin Auditorium, George O. Walker Auditorium, or any other facilities must submit a request form to the Administrative Assistant to the President. Submitting a request does not guarantee the use of the facility. Once the form has been received your request will be reviewed. Once reviewed, you will receive notification of approval or denial of your request from the Administrative Assistant to the President. If your request is approved, a Technical Services request form for the facility requested must be submitted at least two weeks prior to your event. Technical services are only available for the McGlothlin-Street Theatre in the Gregory Center and the Mary B. Martin Auditorium in Seeger Chapel. Elizabeth Leitner Gregory Center for the Liberal Arts was dedicated February 1, 2008 and houses the McGlothlin-Street Theatre. The theatre is a state-of the-art facility that includes a 294-seat theatre with proscenium stage, fly system, orchestra pit, green room, dressing rooms, box office, and concessions area. The theatre is used for the college’s celebrated theatre arts program, humanities program, academic lecture series, and various campus and community events. Seeger Memorial Chapel was dedicated November 4, 1967. 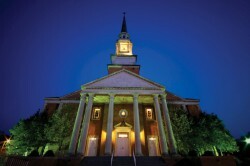 The chapel is a multi-purpose structure serving the college in worship, instruction, lectures, concerts, and drama. 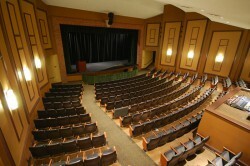 The main sanctuary-auditorium, which seats 1145, was renovated in summer 2010 and named the Mary B. Martin Auditorium. The George O. Walker Auditorium, located on the lower level, accommodates 125 and is named in honor of George O. Walker, a long-time trustee and friend of the college. Are you a Milligan college student, faculty or staff member? Library rooms can be reserved on the P.H. Welshimer Library's website at http://library.milligan.edu/home/roomreservation/. E.g. play, dance recital, lecture, etc. Please note that Milligan College may not be able to accommodate requests made within two weeks of the date/s needed due to the availability of the facilities, equipment, and/or staffing needs. Please take this into consideration when making your request. Though availability of our facilities is never guaranteed, the further in advance of the dates needed your request is made, the higher the likelihood of availability. Please note that there must be one adult supervisor (age 18 or older) for every 10 children participating. Only check "no" if you do not require ANY technical services for your event, including microphones, lighting, projectors, etc. Please be advised, if your request is approved, the Technical Services Form must be completed at least two weeks prior to your event. This form is located on the Milligan website. If this form is not completed in a timely manner, Milligan College may be unable to fulfill your equipment, staffing, or other requested needs. Please allow us adequate time to properly prepare to serve your technical needs by giving as much notice of your technical needs as possible. E.g. SGA, Campus Activities, Theatre, Christ in Culture class, etc. Applicants, event attendees, and participants will leave the facilities, equipment, and campus of Milligan College intact, clean, and fee of debris or damage following the scheduled activity. If these conditions are not met, applicants may be subject to additional cleaning charges or made responsible for any repairs and/or replacement of any equipment, supplies, or facilities damaged or destroyed. In case of cancellation, the applicant should provide notification as soon as possible. Milligan College reserves the right to cancel this agreement at any time if it deems such action advisable and in the best interest of the college. No tobacco use or consumption or transportation of alcoholic beverages will be allowed on the campus of Milligan College. Activities which involve or encourage the violation of local ordinances, state statutes, or federal laws will result in the immediate termination of this agreement cancellation of any use of college facilities. Milligan College reserves the right to cancel this agreement if at any time the college believes information given by the applicant may be false or misleading or if, in the opinion of the college, the event may cause harm to the reputation of the college, be in conflict with the values of the college, on in any other way endanger person or property. Parking information including lots available for use and the provision of directional signage is available upon the request of the applicant. Milligan College security personnel will be present on campus during normal security hours. Additional security needs for any use of college facilities will be the responsibility of the applicant and must be approved by the college. All applicants will be asked to provide a certificate of liability insurance coverage naming Milligan College as an additional insured on the requesting organization’s policy. Groups not providing certificates of liability insurance will be evaluated by the Facilities Use Review Panel and/or President’s Cabinet, which may refuse the application due to the lack of insurance certification. By checking this box, the applicant certifies that they are authorized by the organization they represent to submit this request and acknowledges that they have read, reviewed, and confirmed event details listed above. Additionally, the applicant acknowledges that they have read and agree to the terms and conditions stated within this document and the Milligan College Use of Facilities Agreement.